Florida residents went to the polls last week to vote on Amendment 2, which would have legalized medical marijuana and created hundreds of millions of dollars in business opportunities. The measure garnered 3,363,522 votes – more than Alaska, Arizona, Colorado, Maine and Nevada received combined when those states legalized medical marijuana in the past. But to no avail: The tally represented 58% of the vote, slightly less than the 60% it needed to pass under Florida’s super-strict law regarding constitutional amendments. 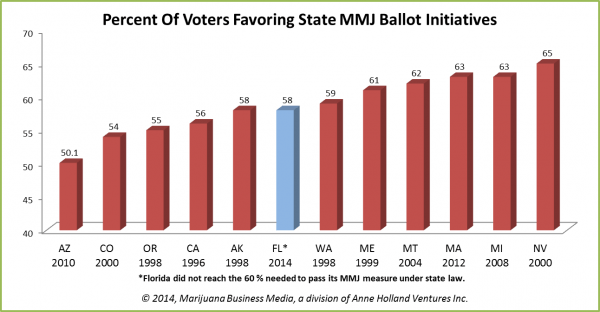 This chart offers a closer look at how support for Florida’s measure in the 2014 election compares to other states that legalized medical marijuana via the ballot box in the past. The chart is missing DC, we passed it 69% of the vote in 1998, although Congress blocked it, then the District Council completely amended it. Florida stole the Presidential Election in 2000 from the Majority Vote, now they are stealing medicinal cannabis with the same excuse? Somehow I would think the majority is a basic Democratic principle? @Dan…good argument up until the “stole 2000 election.” Credibility shot…tool. Everything is For Sale in Floriduh! Biggest contributor to fight against MMJ in FL was a Casino Mafioso from Nevada where MMJ now is available ! So who was in the fix?